Mastering corners is a skill that takes most motorcyclists years. In fact, cornering is a skill that is often enhanced, evolving and is often never complete. If each and every bend was exactly the same, cornering would be a relatively easy skill to learn. It’s the huge variety though, different degrees, cambers, ascending and descending gradients. Then you have different road surfaces – some good, some dangerous to motorcyclists. Other hazards such as static obstacles that can easily obscure your view. Lots to think about, and on top of all that, there’s the weather to contend with too. 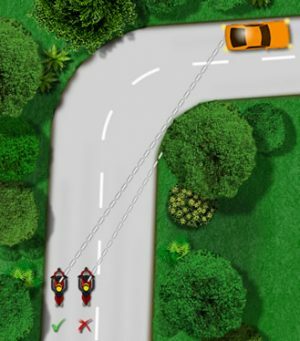 Statistically, failure to negotiate a corner represents the second most frequent reason for motorcyclist accidents. Essentially, you can never acquire enough knowledge and experience on the ability to corner. Successfully negotiating every bend in the road that comes your way requires a combination of various skills. This is essentially defensive riding. When negotiating a right-hand bend, keep to the left of your side of the road. Keeping to the left will improve your view of the road ahead as can be seen in the diagram. Keeping to the left will also give you distance from a vehicle that may be approaching from the other direction and taking the corner too wide. If you ride too close to the centre line on a right-hand bend, as you bank over your head might cross over into the other side of the road putting yourself in danger. When negotiating a left-hand bend, keep to your normal road position. Positioning close to the centre line may slightly improve your view of the road ahead, but may also put you in a hazardous position, especially if an oncoming vehicle cuts the corner when coming the other way. Continuously learn, develop and maintain skills throughout your motorcycling career. Corners vary significantly and each one requires different skills. The tips and advice below offers a general procedure that should be undertaken by each rider. The sooner you locate a corner, the more time you’ll have to prepare. Always observe road signs that may warn you of a bend in the road. A sign may tell you if it’s a single or double bend. Double or multiple bends are almost always signed. 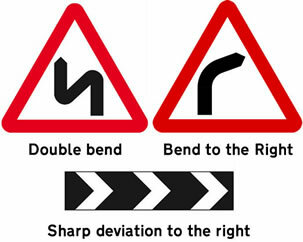 On particularly hazardous bends, road markings or deviation in the road (chevron signs) are often used. Road markings will often warn you to slow – they are telling you that for a reason. Assess the situation to gauge how sharp the bend is. Are there chevron signs or road markings indicating is is hazardous? Is it a single bend or multiple bends? Is there a footpath? There’s the potential there might be pedestrians in the road if not. Is it a country road, is there slippery mud from farm vehicles, is there a slow moving tractor round the corner? Observe the condition of the road – are there potholes? What’s the camber like? It will be too late to find out this information when in the middle of negotiating a corner and your brakes are unable to help you. Always use the OSM PSL routine on the approach to a corner, take up the best position for that bend and look ahead, at where your exit from the corner is. Always adjust your speed prior to the bend and avoid braking whilst rounding the bend – except in an emergency. Braking whilst turning will render your bike unstable, increasing the potential for a loss of traction. As you are rounding the corner, gentle use of the throttle is advised. Use the appropriate gear for the corner, careful use of throttle and to select the correct line through the corner. You have observed the situation and understand what hazards you are dealing with. You anticipate potential hazards, but you must ensure you plan for them. The potential hazards that you have anticipated, are you traveling at a sufficient speed so that you could safely stop in time?